I still have three unread ones! I’ll try to find time to finish them before the year ends 🙂 In the meantime, READ THE BANNED. Challenge your mind and your soul. Find out what topics or themes ignite your fire. This is the only way to learn and to grow intellectually. I felt that Rilke spoke to me from his grave. Not in the haunting way as ghosts do, but as a gentle whisper in my ear like a guardian angel that I should keep going, that I was on the right track. Questions on how I should really live my life arise every now and then, and it was just at the right time that I finally managed to get a copy of this and read through its pages. It was very assuring and consoling, and I would like to share the lines that I liked which might echo in you too. 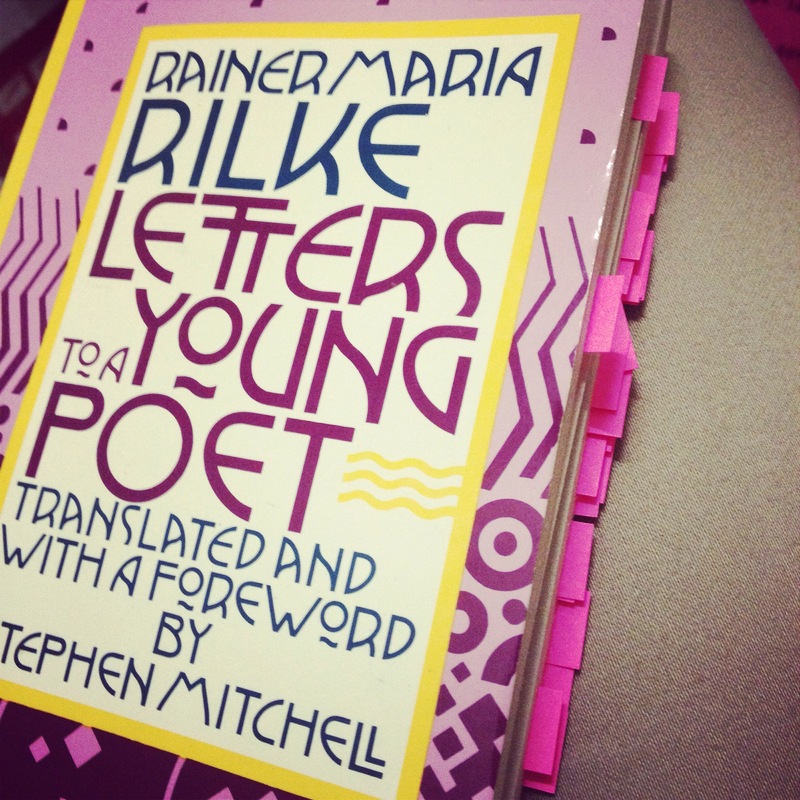 Crossroads are always confusing and difficult, but oftentimes answers come from literature, as in the case of Rilke’s letters. …go into yourself and see how deep the place is from which your life flows; at its source you will find the answer to the question of whether you must create. Accept that answer, just as it is given to you, without trying to interpret it. Perhaps you will discover that you are called to be an artist. Then take that destiny upon yourself, and bear it, its burden and its greatness, without ever asking what reward might come from outside. For the creator must be a world for himself and in Nature, to whom his whole life is devoted. Always trust yourself and your own feeling, as opposed to argumentations, discussions, or introductions of that sort; if it turns out that you are wrong, then the natural growth of your inner life will eventually guide you to other insights. Allow your judgments their own silent, undisturbed development, which, like all progress must come from deep within and cannot be forced or hastened. Everything is gestation and birthing. To let each impression and each embryo of a feeling come to completion, entirely in itself, in the dark, in the unsayable, the unconscious, beyond the reach of one’s own understanding, and with deep humility and patience to wait for the hour when a new clarity is born: in understanding as in creating. …have patience with everything unresolved in your heart, and to try to love the questions themselves as if they were locked rooms or books written in a very foreign language. Don’t search for the answers, which could not be given to you now, because you would not be able to live them. And the point is, to live everything. Live the questions now. Perhaps then, someday far in the future, you will gradually, without even noticing it, live your way into the answer. Perhaps you do carry within you the possibility of creating and forming, as an especially blessed and pure way of living; train yourself for that—but take whatever comes, with great trust, and as long as it comes out of your will, out of some need of your innermost self, then take it upon yourself, and don’t hate anything. Bodily delight is a sensory experience, not any different from pure looking or the pure feeding with which a beautiful fruit fills the tongue, it is a great, an infinite learning that is given to us, a knowledge of the world, the fullness and the splendor of all knowledge. And it is not our acceptance of it that is bad; what is bad is that most people misuse this learning and squander it and apply it as a stimulant on the tired places of their lives and as a distraction rather than as a way of gathering themselves for their highest moments. Love your solitude and try to sing out with the pain it causes you…be happy about your growth, in which of course you can’t take anyone with you, and be gentle with those who stay behind; be confident and calm in front of them and don’t torment them with your doubts and don’t frighten them with your faith or joy, which they wouldn’t be able to comprehend. Seek out some simple and true feeling of what you have in common with them, which doesn’t necessarily have o alter when you yourself change again and again; when you see them, love life in a form that is not your own and be indulgent toward those who are growing old, who are afraid of the aloneness that you trust. …believe in a love that is stored up for you like an inheritance, and have faith that is in this love there is a strength and a blessing so large that you can travel as far as you wish without having to step outside it. It is also good to love: because love is difficult. For one human being to love another human being: that is perhaps the most difficult tast that has been entrusted to us, the ultimate task, the final test and proof, the workd for which all other work is merely preparation. That is why young people, who are beginners in everything, are not yet capable of love: it is something they must learn. Loving does not at first mean merging, surrendering, and uniting with another person (for what would a union be of two people who are unclarified, unfinished, and still incoherent—? ), it is a high inducement for the individual to ripen, to become something in himself, to become world, to become world in himself for the sake of another person; it is a great, demanding claim on him, something that chooses him and calls him to vast distances. But if we nevertheless endure and take this love upon us as burden and apprenticeship, instead of losing ourselves in the whole easy and frivolous game behind which people have hidden from the most solemn solemnity of their being, –then a small advance and a lightening will perhaps be perceptible to those who come long after us. And this more human love (which will fulfill itself with infinite consideration and gentleness, and kindness and clarity in binding and releasing) will resemble what we are now preparing painfully and with great struggle: the love that consists in this: that two solitudes protect and border and greet each other. Perhaps many things inside you have been transformed; perhaps somewhere, someplace deep inside your being, you have undergone important changes while you were sad. The only sadnesses that are dangerous and unhealthy are the ones that we carry around in public in order to drown them out with the noise; like diseases that are treated superficially and foolishly, they just withdraw and after a short interval break out again all the more terribly; and gather inside us and are life, are life that is unlived, rejected, lost, life that we can die of. If only it were possible for us to see farther than our knowledge reaches, and even a little beyond the outworks of our presentiment, perhaps we would bear our sadnesses with greater trust than we have in our joys. For they are the moments when something new has entered us, something unknown; our feelings grow mute in shy embarrassment, everything in us withdraws, a silence arises, and the new experience, which no one knows, stands in the midst of it all and says nothing. Thank you, Rilke. I have somehow figured it out.